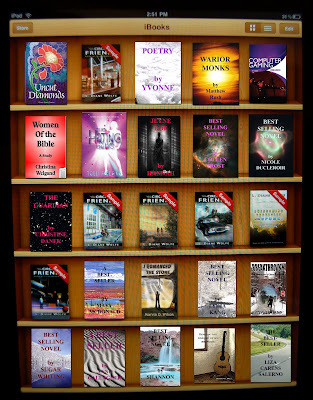 Alex J. Cavanaugh: Everyone's in the iBookstore!! HOW cool! You are so clever, Alex! 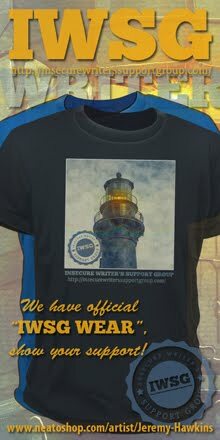 I love the creativity behind your iBookstore, and the support for your blogger/writer friends it represents. You are awesome! Oh my god dude, that is so nice and you are so thoughtful. What a fun thing to see just after getting to work this morning! You're right too, we will all be there one day as long as we never give up. Congratulations on your awards well deserved. I got a book but not on show on my blog if I put it on would it be in ipad? 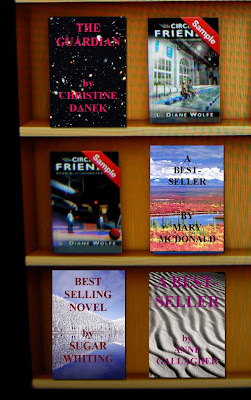 Yvonne, I looked for your book on your blog and since I don't know your last name, I couldn't search anywhere else for it. Sorry I couldn't get the actual cover up for you! Matthew, glad you like it! I thought it'd be encouraging. Nicole, I hope you could read the tiny print on your book. I should've made it bigger. I'm curious how this word 'awesomesauce' became so common on the blogosphere? Nice job on the bookshelf! What a great and wonderful thing for you to do. Congrats on your awards! Awwww dude! That is awesome sauce-age, right there. I give thee a round of applause for your brilliance! That was freakin' Epic, dude! That is awesome!! What a cool thing to do, Alex. I loved seeing my book on that shelf. Now if only my pub can figure out what they're doing with Smashwords.... The latest I heard was there were fears about formatting issues? Have you noticed any weird formatting from Smashwords? This made my day. Thanks for including me on the shelf, face out. I could hope for no better! That's a really cool thing to do, Alex. 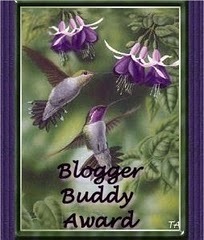 You are an awesome blogging/writing friend. Ted, I've no idea how sauce was included! Glad you liked it, Karen. And no idea on Smashwords. My publisher does all that stuff. Alex, you just made my day! I LOVE my cover and you've inspired me to keep chugging to make sure there is one sometime. Back to writing now, so that cover dream comes true! Wow, you found all of my books! Thanks, Alex. And I hope everyone appreciates what you did - that was really nice. That's so awesome - you have my cover right there! Yay! Thank you so much - this has made me smile and drink more wine! That was really unique and creative. It must have taken a lot of time to do that. Awesome!! I love the close ups. And yes you deserve all these awards! Thanks for going to so much work to support all of us. You rock! Thank you so much. It was cool to see my book on that shelf. You are awesome. 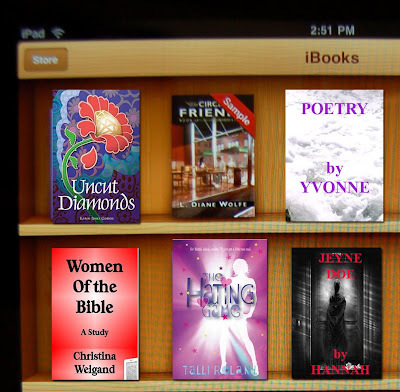 Love your iBookstore, what a great idea! Congrats to you for the awards, and to the new winners. Have a great weekend! Thanks Alex. This is really cool. And I'm inspired. I'll get those questions over to you this weekend. Have a great holiday. Everyone is welcome! And I'll be watching for the questions, Stephen. Thanks again. Congrats on even more awards. Don't use all your awesomesauce in one place no y'hear? That was a brilliant gesture putting up books for all those people, I wish all of them (and you) the best in achieving your endeavors! Lots of work here. Congrats on your awards. Hart, I will do the same for you! Thanks, Bryan. Just seemed sad that only one of my author/writer friends had books in the store so I decided to correct that situation - to the best of my abilities! Glad you like it, Marvin! So COOL!! Thank you! This is the best present I've got this week :) Thanks again! make everyone's day! I will post about you and the award tomorrow! Awesomesauce award? I want that one. Coolest named award ever. Congrats on the awards Alex. I like the Awesomesauce award name as well. You are a true blog buddy. Awesome. You're welcome, Ellie. I hope everyone's covers are okay. And twelve teenagers? You are one brave woman. Cheeseboy, how about an anwesome cheesesauce award? 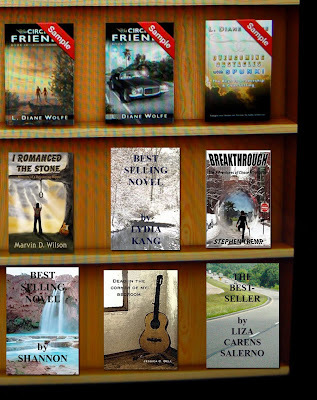 Inspiring book covers, I thought at first, Yvonne and Shannon, who are my blog buddies have a published book selling like hot cakes hence this post! Sorry, Amity! I just went through the list of comments on my Monday post and made covers for those people. I didn't leave you out on purpose. Well, dang, Alex, I don't even have a print copy of Computer Gaming. My husband has an iPad. I'm going to go download it! Woo-woo. I'm in the iBookstore. Thank you Alex for my book. I love the cover, reminds me of the beach, even though it's the desert. And I'm glad you made them a little bigger. I couldn't find it the first time I looked. 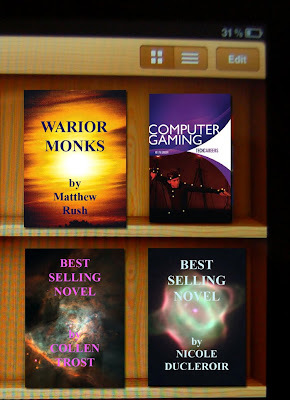 Alex, that was sweet of you to recreate the covers for those of us not yet in the iBookstore. Some day it will be cool to see the real one up there. Piedmont and Helen, you're welcome! And I hadn't counted on the image being so small, which is why I went back and added larger sections. Aw, that's great. I'm sure everyone likes seeing their books on the shelves!